The following article is about Loomis Sayles Strategic Income A fund. This Loomis Sayles bond fund is part of taxable multisector fund. It can invest in varieties of bonds or fixed income like government bonds or treasuries, corporate bonds, convertible, foreign debts, and more. Details about this mutual fund can be found below. 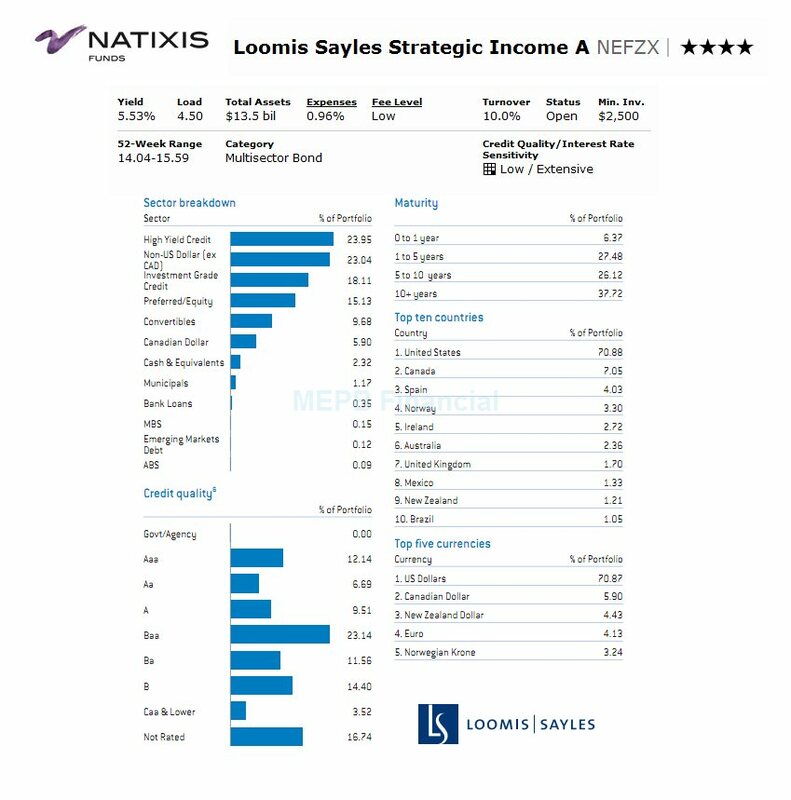 The Loomis Sayles Strategic Income fund seeks high current income and its secondary objective is capital growth. This bond fund invests all of its assets in income producing securities with a focus on U.S. corporate bonds, convertible securities, foreign debt instruments, including those in emerging markets and related foreign currency transactions and U.S. government securities. It may invest >35% of assets in preferred stocks and dividend-paying common stocks. This Loomis Sayles fund may also invest in Rule 144A securities, structured notes, zero-coupon bonds, pay-in-kind bonds, mortgage-related securities, stripped securities, swaps, futures, and other derivatives. 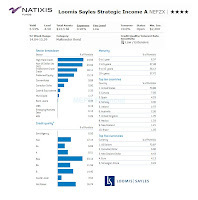 This Loomis Sayles Strategic Income fund is offered under the Natixis Funds family. Daniel J. Fuss has been managing this fund since its inception in May 1995. This popular fund has a dividend yield of 5.82%. This dividend is distributed on monthly basis. The most recent distribution was in November 2011 ($0.06). The annual expense ratio is 0.96% which is lower than the average in the Multisector Bond category (1.15%). The fund has an annual holdings turnover of 27.00%. This is much lower compared to the average of 132.69%. The total net assets of this fund are $12.88 billion. Morningstar gave this fund 4-star rating. It has 12 years of positive return and 3 years of negative return. The best 1-year total return was recorded in 2009 (39.30%). The fund has -0.03% YTD return. Based on the load adjusted return, this top bond fund has returned 10.99% over the past three years and 10.13% over the past ten years. The fund benchmarks are Barclays Capital U.S. Aggregate Bond Index and Barclays Capital U.S. Universal Bond Index. To start investing in this best bond fund, investor will need a minimum of $2,500 for brokerage account and $1,000 for IRA account. The 12b1 fee is 0.25% and the front end sales load is 4.50%. There are 105 brokerages that sell this fund such as Scottrade Load, Merrill Lynch, JP Morgan, Pershing Fund Center, Schwab Institutional, Fidelity Retail Funds Network, Firstrade, Ameriprise Brokerage, E Trade Financial, etc. The other classes of this NEFZX fund are NECZX (Class C) and NEZYX (Class Y). The CUSIP of NECZX is 543487-26-8 and the CUSIP of NEZYX is 543487-25-0. As per the third quarter of 2011 report, this NEFZX fund has a total of 590 holdings. The top 5 sectors are High Yield Credit (23.95%), Non-US Dollar (ex-CAD) (23.04%), Investment Grade Credit (18.11%), Preferred/ Equity (15.13%) and Convertibles (9.68%). The top 10 countries include United States (70.88%), Canada (7.05%), Spain (4.03%), Norway (3.30%), Ireland (2.72%), Australia (2.36%), United Kingdom (1.70%), Mexico (1.33%), New Zealand (1.21%) and Brazil (1.05%). According to the fund’s prospectus, the principal investment risks include Credit Risk, Currency Risk, Derivatives Risk, Equity Securities Risk, Fixed-Income Securities Risk, Foreign Securities Risk, Interest Rate Risk, Issuer Risk, Liquidity Risk, Management Risk, Market Risk, Mortgage-Related and Asset-Backed Securities Risk, etc.